Editors’ note: This article has been adapted and expanded from Paul Light’s new book, Driving Social Change, from John Wiley & Sons publishers. How do societies create the breakthroughs needed for a more just, tolerant, healthy, educated, and equitable world? How do they challenge the prevailing wisdom without losing hope? How do they enact lasting change and protect it from the inevitable backlash? Many of us look to 24/7 heroes and highly visible organizations for the answers. After all, they get the uncommon hero awards and the public admiration, often because they have forged their brand identities around big-ticket change. They are easy to identify and admire. However, there are dangers in focusing almost exclusively on what I call Type-A, hero-driven social entrepreneurship as the central driver of change. First, we may underappreciate the new combinations of ideas that come from Type-B, team-driven social entrepreneurship, which may yet prove to be a more effective approach for challenging the status quo. Second, we may underinvest in other, equally powerful drivers of social change needed for the enactment (broadly defined), implementation, expansion, and defense of past breakthroughs. And, third, we may underestimate the impact of the challenges embedded in the larger breakthrough cycle that ignites, frustrates, and sustains change from the initial commitment to act all the way through to the full embrace of a new prevailing wisdom (see figure 1 below). Social change is messy and unpredictable, but it involves a set of familiar challenges from beginning to end. The breakthrough cycle, as I call it, can move quickly as proposals advance in the wake of a crisis or during a defining moment in history. Other times, the cycle can stall as the prevailing wisdom fights to hold its ground. Still other times, it can move backward as the public appetite for change dissipates, complacency takes hold, or the prevailing wisdom regains power. The cycle shapes the primary drivers of social change: the social entrepreneurship and innovation that supplies new proposals for unsettling the status quo; the social safekeeping needed to protect, expand, repair, and adapt breakthroughs already made; the social exploring essential to monitor key trends, evaluate what works, and even challenge the prevailing wisdom about how to challenge the prevailing wisdom; and the social advocacy required to turn proposals into reality. Change does not begin with the end game that produces Nobel Peace prizes and documentary stardom. Rather, it starts with an initial, often highly personal, commitment to engage and moves forward in rough order with a careful mapping of opportunities and obstacles, the design and articulation of a powerful vision of the future, the agitation created by social entrepreneurship, safekeeping, exploring, and/or advocacy, the aggregation of pressure for action, disruption of the prevailing wisdom, enactment of a deep breakthrough, and constant vigilance in defending the new prevailing wisdom from resistance and pushback. Without success at each of these stages, we will never convert so-called intractable problems such as poverty, illiteracy, disease, intolerance, and inequality into distant memories. As such, social entrepreneurship, safekeeping, exploring, and advocacy are only means to achieving durable change. Simply put, we must choose the drivers that will achieve the best results. That may mean social entrepreneurship, which is no doubt a wondrous thing, but the best driver may be safekeeping, exploring, and/?or advocacy instead. The driver must fit the destination, not vice versa. We also tend to forget that social change is radically different from business change. While a new business product often knocks out the status quo for good, rendering once-marvelous products obsolete almost overnight, social change is always contested. This resistance comes at every stage of the cycle, but is particularly intense once a breakthrough occurs. It is one thing to enact a breakthrough idea such as mandatory health insurance, and quite another to defend it as time marches on and complacency sets in. The 2010 election and imminent Supreme Court challenge to Obamacare is a perfect example of ongoing resistance. At least for social change, the old prevailing wisdom rarely dies. Like a weary prizefighter, it always dreams of a comeback, and often gets a rematch in a future election or crisis. Changing the prevailing social wisdom, which some call the “social equilibrium,” involves a set of stages that moves through the valley of dead ends and exhaustion toward the distant peaks of achievement. The valley is not easy to navigate, but it can be mapped. Every journey is different, but all appear to involve nine relatively discrete stages, each one influenced by the other, as destinations change and experience grows. The questions that guide each step in the drive for a new prevailing wisdom are relatively simple. Stage One: Are You Ready and Willing to Engage? The first stage of social change involves a personal and/or collective commitment to social change. This commitment involves a fundamental belief that there is something wrong in the world that must be changed. It is built on a firm embrace of the need to take action on a specific issue, such as hunger, poverty, illiteracy, disease, and so forth. It is not built on a call to glory, power, and riches, though all may follow. Rather, it involves a felt sense of empathy, altruism, and, most important, outrage. This commitment to a new prevailing wisdom is the bulwark of change and requires both purpose (the personal drive to create change) and perseverance (the willingness to engage for as long as it takes). Change is impossible without both components, especially given the inevitable frustrations and setbacks that any effort to reset the status quo faces. Stage Two: What Are Your Assets and Obstacles? The second stage of the cycle involves an evaluation to understand the assets and obstacles that shape ultimate success. There are at least have assets that temper or encourage social breakthrough in its first moments: (1) a public demand for impact, (2) a willingness to engage, (3) the basic freedoms to assemble, petition, and speak truth to power, (4) institutional responsiveness, and (5) the execution of impact. Stage Three: What Are the Options for Breaking Through? The third stage of the cycle involves a deliberate and disciplined sorting process. It is designed to assemble the components of a breakthrough proposal, from ideas (new and old) to opportunities, partners, organizations, platforms for influence, and even adversaries. Like sorting the pieces of a jigsaw puzzle, this process produces the initial sketch of a breakthrough proposal. This stage may include new approaches but is also likely to include a good measure of old ways. This sorting guides the early journey through what Duke University’s Paul Bloom and J. Gregory Dees call the “ecosystem” of change. This ecosystem contains everything from support (funding, demand, and organizational capacity) to opposition, each of which seems to flow through the system independently. The change agent’s role is to pull from each stream in imaging a new world, designing an effective idea, identifying an opportunity, and building a strategy for ultimate impact. Stage Four: What is Your Ultimate Destination? The fourth stage uses these components to design a precise vision of the world as it should be. Designing this new prevailing wisdom requires a mix of imagination, invention, research and development, strategic planning, and second-guessing. The point is not to produce a formal proposal just yet but to identify the hoped-for destination of change in detail, including measures that might reveal progress and benchmarks for progress. The stage also involves initial decisions on where the change effort will be housed. Does it require an entirely new organization, with implications for startup costs and delay? Or can a breakthrough emerge from an existing organization, with implications for bureaucratic delay and interference? The answer depends on the destination for change; form must follow function. Stage Five: How Will You Take the Offense? The fifth stage of the cycle produces a formal proposal to agitate the prevailing wisdom. Agitation might involve a new combination of ideas (social entrepreneurship), expanding, improving, or defending an idea that already works (social safekeeping), identifying trends and data that help make the case for action (social exploring), and activating stakeholders, partners, publics, and networks toward action (social advocacy). As with the cycle as a whole, this stage involves a great deal of trial and error. A powerful breakthrough proposal is rarely formed in the first pass: it is imagined, shaped, tested, and developed into a workable, albeit often audacious, new combination. It can become an “idea in good currency” only if it can withstand the intense scrutiny it will encounter as it moves through the proof-of-concept stage. This willingness to question (and measure) is essential as ideas begin to penetrate the existing equilibrium. So is the alertness to opportunities for action. Stage Six: How Will You Maximize Pressure? The sixth stage of the cycle aggregates this agitation for focused action, almost always through networks composed of committed individuals, groups, organizations, communities, and movements. These actors work together in a virtual space that concentrates firepower for maximum effect. Working through what many now call “catalytic collaboration,” these breakthrough networks create a wave of “creative destruction” that targets specific opportunities for unsettling and undermining the status quo. Although I believe breakthrough networks are the most powerful form of aggregation, some organizations are so big and well resourced that they can create disruption without help. Even here, however, networks almost always develop around them. In this sense, these organizations act as “nodes of impact” as others join their cause. Stage Seven: Which Tactics Will You Use to Disturb the Prevailing Wisdom? The seventh stage of the cycle involves an intense and focused effort to disrupt and displace the prevailing wisdom. The intention to disrupt is one thing, but actual impact is quite another. Using a variety of tactics that includes hundreds of discrete activities that are shaped into a kind of explosive charge, breakthrough networks are designed to upend the prevailing wisdom. Stage Eight: How Will You Secure Success? The eighth stage of the cycle involves a sustained effort to secure the breakthrough through enactment, broadly defined as a demonstrable change in mindsets, policy, or behavior. Although enactment is often used to describe a formal policy change such as legislation, the term has much broader meaning as a way to describe the realization of actual success through a variety of means. Policy is only a means to an end, just as are changes in social norms and expectations for a more just world. Stage Nine: How Will You Protect the New Wisdom? The breakthrough cycle does not end with the enactment of the breakthrough. It continues with an almost inevitable and long-term effort to protect the breakthrough as it takes its place in a new prevailing wisdom. Social change does not require massive organizations or individual heroes. To the contrary, the focus on creating giant organizations can slow the process by absorbing resources best invested elsewhere in the breakthrough cycle. Similarly, the search for individual glory so often promoted by funders and governments can distract from the collaboration that is so important in challenging a highly organized and well-defended status quo. The field could use fewer awards perhaps, and greater focus on doing whatever it takes to attack the misguided but prevailing wisdom that despair will always be part of the human condition. There is room for further research and practice at all stages of the breakthrough cycle, but I believe that at least three areas need immediate action: (1) drawing more people and organizations into committing to change, (2) developing more effective strategies and tactics for aggregating energy, and (3) finding the most effective approaches for disrupting the status quo. Social change is impossible with a fundamental commitment to action that resides in two basic human qualities: purpose and perseverance. 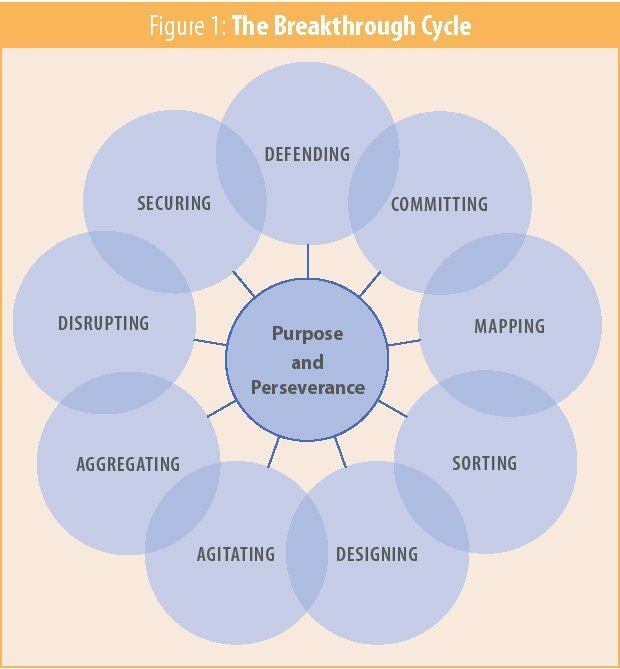 Purpose is central at all stages of the breakthrough cycle. Social change is rarely possible without an underlying call to action. This calling is driven by a sense of outrage about the state of the world, empathy for the victims of intolerance, disease, hunger, and so forth. First, why have I chosen this path? Second, who am I serving in this battle for change? And third, what must I do, even sacrifice, to achieve impact? The answers to these questions guide the entire journey to a new prevailing wisdom. Purpose remains the centering force of change. In turn, purpose becomes impact through perseverance. Sometimes defined as “grit,” “obsession,” “endurance,” or “resilience,” perseverance not only increases the odds of success but also reduces the hazards of failure. Just knowing that one has done everything possible to succeed reduces the frustration of early failure while also increasing subsequent tenacity and perseverance. Thus perseverance produces more perseverance. The question here is what might be done to enhance perseverance as the fight for change continues year after year. The answer is still uncertain, in part because we do not quite know where perseverance resides. Is it a deeply rooted trait, such as physical strength or the need for achievement? Is it embedded in the “moments of obligation” that Echoing Green—a global nonprofit that funds social-impact efforts—believes spark action? Is it a consequence of believing that anything is possible? Or is it even the product of spirituality or even love for humankind? My research suggests we should focus most closely on the core values of integrity, trust, honesty, and faith. Integrity involves a deep personal alignment on the core purpose of social change. This characteristic is often revealed in the personal discipline and courage required to stay on course. Simply asked, does the commitment to change reside in a personal willingness to sacrifice, make tough choices, and remain centered on the mission despite turbulence, resistance, and setbacks encountered en route to impact? Defined as an unwavering application of purpose in day-to-day operations, integrity forms at least part of the “ethical fiber” that many define as essential to social change. Integrity does more than center a leader. It also drives an organization’s culture. Integrity provides the courage to push authority downward, lower the barriers to internal collaboration, encourage full participation, prime the organization for innovation, accept new ideas, and drive the call for change throughout the hierarchy and into the community. Organizational integrity also involves readiness to create the conditions for others to succeed, even when they do not reside inside an organization. Integrity provides the strength to engage in common cause, withstand inevitable setbacks, and create the momentum to change the world. Trust is essential for risk taking and is based on raw experience. It can be deeply grounded in rigorous analysis and tightly linked to past lessons learned, but sooner or later, every change involves a decision to trust a given choice. If change agents are disciplined about their work, they should encounter few surprises as they make decisions. Trust manifests in many ways. It helps change agents withstand the second-guessing that often accompanies decisions; it gives them the courage to celebrate success and even have fun; and it permits them to stand behind their choices as they face the winds of impact. Change agents need not be great prophets to lead organizations beyond the zone of the possible. But in doing so, they need to trust their judgment. No matter how much cost-benefit analysis an organization pours into decisions, no matter how many evaluators and auditors an organization brings to each task, change agents must trust their instincts. And that requires trust in their ideas. Trust must also involve a willingness to admit one’s own frailty. Trust, and the delegation that goes with it, is essential to maintaining a balanced life. Change agents must not sacrifice all semblance of a normal life and must pay attention to their physical and emotional health. Change agents work in challenging, stressful environments and experience plenty of organizational pressure. Not everyone has the temerity to stand up to the prevailing wisdom and articulate an alternative future. Trust gives these change agents the underlying strength to continue their long march to impact. Honesty involves a metaphorical willingness to look in the mirror, through a clear commitment to measuring results, open conversations about organizational performance, clarity about who decides what, and honest admissions about success and failure. And for change agents of all kinds, honest dialogue involves knowing when to say yes to a particular intervention and when to say no to innovation for innovation’s sake. Change agents should give permission to fail only if failure is an option, for example. Similarly, they should ask for dissent only if they are ready to hear it. The key question is how organizations handle initial mistakes and dissent en route to change. If the first mistake is greeted with fury, it will likely be the last risk an organization sparks. And if the first dissent is met with censorship, it will likely be the last dissent the organization hears. Listening is a two-way street;? honest dialogue means keeping the door open for those who have something unpleasant or contrarian to say. Faith is at the center of perseverance. It is based on a sense that there is something bigger than the self. Faith is not rooted in known experience or empirical facts. Rather, it is built on a belief that change involves a leap into the unknown and the risk involved. As such, faith often involves a belief that there is a helping hand, a larger force, and even an unflinching protection somewhere beyond the change itself. Faith is an activator, comforter, and sustainer. Faith does not involve religious beliefs per se. Rather, it involves a connection to some greater source of energy, which some describe as a product of a broader search for meaning, unity, and a kind of transcendence. This connection is at the core of ultimate perseverance. When asked what keeps them going day after day in their small steps forward, change agents often cite their basic belief that good work is somehow protected. Simply put: change will occur. Change agents repeatedly say they draw on something much deeper than transitory optimism. They make leaps of faith, after all. These leaps may draw on evidence, organizational capacity, and networks of friends and colleagues, but they are leaps nonetheless. By any name, social entrepreneurship is always a critical driver of social breakthrough. But it is not the only driver by far. Indeed, sometimes a new combination of ideas will be irrelevant for a new prevailing wisdom. We often know what already works for changing the world and mostly need to provide enough funding to expand and implement it. We also need to protect what works from shortsighted budget cuts, stealth dismantling, and the failure to anticipate emerging trends that will buffet it. In some cases, the most important decision to achieve change is not to innovate but to implement. Much of the aggregation needed to achieve change of all kinds involves broad networks in which individual and organizations submerge themselves for the greater good. These social-breakthrough networks are highly ?uid collections of individuals and organizations that work together to challenge the prevailing wisdom and disband soon afterward. As such, social-breakthrough networks resemble the hazy issue “mashups” that, during the late 1970s, political scientists ?rst described as coalitions built on sand. In contrast to the old-fashioned “iron triangles” that protect the conventional wisdom through tight links between the bureaucracy, interest groups, and congressional committees, breakthrough networks exploit relatively short-term opportunities for breakthrough ideas. Breakthrough networks have several characteristics that play a prominent role in their formation and impact. First, they are often temporary. Some members leave the network as compromises are made; others join with each new opportunity for expansion, and still others are bought or rented with a campaign contribution or funding for a pet project. Second, there is rarely one breakthrough network fighting for change in a given policy space. There might be one aligned against disruption, for example, and another in favor of action. Although networks exchange members as the policy process moves forward or backward, there may be multiple networks and nodes of contact. A single member, usually an alliance or major interest group, may bring a group of allies to a network, while other members may join as individuals. Third, it follows that members of most networks are loosely coupled. Unlike iron triangles, breakthrough networks are easily broken and rearranged over time. By definition, iron triangles are highly stable and can align against breakthrough networks. As breakthrough networks begin to roll forward, iron triangles often block action. That is why they are called iron, after all. Breakthrough networks do not exist in isolation; they operate in a dense environment of support and opposition. As Bloom and Dees argue in their 2008 article, social breakthrough occurs within an ecosystem that contains many paths to success. Although they focus on social entrepreneurs, their message clearly applies to breakthrough networks as well. To understand and change these social systems, social entrepreneurs, safekeepers, explorers, and advocates should borrow insight from ecology and use an ecosystems framework. Long ago, biologists discovered the limits of studying living organisms in isolation. Biologists gain a deeper understanding only by considering the complicated relationships between organisms and their environments. They look not only at the social-breakthrough impact of environmental factors, such as soil and water, on organisms but also at the impact of these organisms on one another and on their environment. The ecosystem also affects organizations. Management scholars have recognized the parallels between biological and economic systems. Recently, researchers in strategic management have focused greater attention on the parallels between biological and organizational systems, even adopting the phrase ecosystem strategy to refer to an approach for guiding a breakthrough network’s strategic choices. Proponents of an ecosystems framework stress the value of understanding the complexity and dynamics of the wide-ranging forces that a breakthrough network faces. The challenge, therefore, is to focus networks on clear strategies for bringing pressure to bear on an issue such as health care, inequality, hunger, or disease. 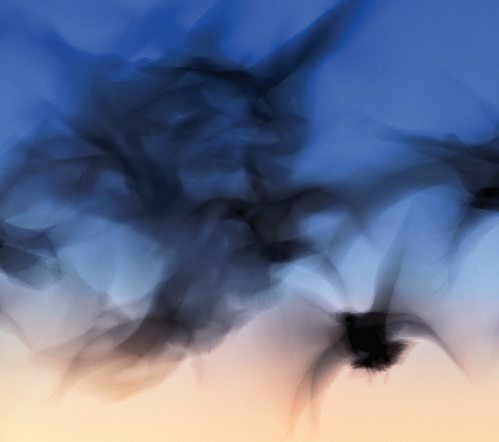 Consider swarming as one of the newest approaches to successful disruption. As Dees describes it, the ecosystem of change is potentially malleable. It is also produces competition and its own set of priorities and opportunities, especially during the brief punctuations in history that produce so much change. Ecosystems are especially useful for understanding the swarming that now animates so much social breakthrough. In essence, swarming involves a tightly coordinated strike from all directions at the same time using widely dispersed “pods” organized into “clusters” to carry out attacks across several fronts. Developed as a new tactic for war, swarming has been most recently tested in the realm of social breakthrough. Although wars will still be found with huge armies and large maneuvers, swarming has become the preferred method for both social and military revolution. From 1994 to 1998, for example, Zapatista rebels in Mexico used swarming to mount a social revolution in the southern state of Chiapas. The revolution relied on a virtual battlefield composed of human-rights groups such as Amnesty International, Physicians for Human Rights, the Jesuit Refugee Service, and Food First to come to its cause through the Internet. What began as a traditional war of bullets soon became a war of e-mails, faxes, and coordinated pressure. As the swarming increased, the Mexican government collapsed into chaos, foreign creditors panicked, and the international community rallied toward a peaceful resolution of the con?ict. Although the Mexican army could easily have destroyed the Zapatista forces, the information “netwar,” as it is now called, brought the government to the negotiating table only 12 days into the con?ict, and again, each time the war ?ared back up. The effort to disrupt the prevailing social equilibrium was carefully targeted and coordinated and was supported by an infrastructure that deployed resources effectively. Participants in the breakthrough cycle have never been under greater pressure to anticipate the future, yet never had so many futures to anticipate. They no longer face a single future or two against which to plan. Instead they face hundreds, if not thousands, of plausible futures, some laden with opportunity and promise, others filled with threat and risk. The proliferation of possible futures has increased the importance of uncertainty as an often disruptive force at all stages of the breakthrough cycle. Uncertainty is not always a negative, however. Uncertainty provides opportunities for quick breakthroughs through agile social networks. Individuals, organizations, and networks can always can fight the uncertainty by hedging against downside risks. But they can also shape futures by hardening themselves for whatever might occur in the set, or landscape of possible futures. In a word, they must invest in robustness. The term robustness is well known to engineers, mathematicians, and even coffee roasters, but it has yet to gain much traction in the field of organizational studies, where the term resilience has much more currency in describing a breakthrough network’s ability to bounce back from crisis and attack. It is important to note that robustness is not just a way to think about networks. It can also apply to change agents, organizations, communities, and wider collaborations. Just as the breakthrough cycle needs to be alert, agile, adaptive, and aligned, so too do the various actors who challenge the prevailing wisdom. They need the capacity to take a punch and give one in return. This de?nition of robustness can be found in my 2005 book, The Four Pillars of High Performance. The book involved a three-year study of the RAND Corporation’s research base and deep interviews with senior RAND researchers. If any think tank knows about managing uncertainty, it is RAND. In the short run, participants in a robust cycle may be less efficient than their peers, if only because they keep at least some of their capital in reserve to hedge against surprise. They may also appear less innovative than are their peers, if only because they may be less willing to bet their effort on a single future. In the long term, however, a robust breakthrough cycle should produce higher growth and more innovation, if only because it protects itself against vulnerability by moving quickly to exploit new opportunities for agitation, aggregation, disruption, and breakthrough. Thus, it hardly makes sense to pursue a given plan if the participants do not have the alertness, agility, adaptability, and alignment to adjust to uncertainty. The issue here is not whether an individual, organization, or network is robust per se, but how much robustness it can muster against a rapidly changing set of futures. In a sense, everyone must think in futures (plural) tense. The same mindset applies to navigating the social breakthrough cycle. Participants in the breakthrough cycle cannot hedge against vulnerability and exploit opportunities unless they can see the many futures they face. At a minimum, thinking in futures (plural) tense means creating signposts that may reveal the potential breakdown of assumptions about a hoped-for future. Some of these breakdowns involve surprises, while others are the product of forks in the road such as global warming and new “unthinkables” and “black swans” such as pandemics and global economic collapse. But whether the breakdown involves surprise or long-term vulnerabilities, the key to alertness starts with a landscape of possible futures against which to plan and continues with an honest assessment of what has to go right for nothing to go wrong and what cannot go wrong for a plan to go right. When their assumptions break down, participants in the breakthrough cycle must act quickly. Having discovered a potential law or impending collapse of a key assumption, they must rally and redeploy resources such as personnel, supplies, logistics, and dollars to strengthen or change the foundation of their load-bearing assumptions. As Winston Churchill wrote of Great Britain’s victory in the long-forgotten 1899 River War in the Sudan, “Victory is the beautiful, bright-colored power. Transport is the stem without which it could never have blossomed.” His quote applies to all stages of the breakthrough cycle, too. Adaptability is not just another synonym for a new round of innovation. As an attribute of robustness, it is best de?ned as the ability to rapidly adjust tactics and/or strategies to meet vulnerabilities and opportunities as signposts of emerging futures reveal them. Sometimes, adaptability will demand true innovation—original, disruptive ideas that challenge the prevailing wisdom in a field; other times, it will involve incremental adjustments in an existing plan. Innovation is a form of adaptability, but not all adaptability involves innovation. Breakthrough cannot occur without a tight alignment among the many participants in the breakthrough cycle. Participants must constantly remind one another of the overall destination, create metrics for assessing success, and reinforce incentives for driving strategy downward and across their organizations and networks. Given the onslaught of urgent threats, it is no wonder that many networks are working so hard to change. Although networks are clearly concerned with innovation and social breakthrough, they must also look for the core infrastructure to manage the enormous uncertainties they face. The breakthrough cycle is not just about aggregation of pressure. It is about producing change through whatever means possible. Some of this change will come from social movements, strategic alliances, and catalytic collaboration. But whatever the tactic, the concept is clear. The breakthrough cycle has enormous potential for addressing urgent threats but has often been stalled by the search for the one in 10 million that Drayton believes might lead the world out of chaos. I believe the greatest obstacle to building an effective, fast-moving cycle is the desire for credit, whether by individual leaders, organizations, or funders. Were there mythic heroes involved in the great breakthrough cycles of the past? The answer is absolutely yes. Mahatma Gandhi, Martin Luther King Jr., and Bobby Kennedy were undeniably exceptional, and clearly obsessed with a vision of the new prevailing wisdom. But they also understood that they were part of a whole larger than the parts and that change involved assets, commitment, to new and old ideas alike, and more. All were willing to share credit widely. Having watched major breakthroughs come and go, it is often impossible to identify a single leader or funder that made it all possible. Credit had to be diffuse, if only to protect the network from the collapse or withdrawal of a single node built on a specific set of actors. We cannot become so obsessed with the heroic leader that we forget the power of a sum greater than the parts. The civil rights movement could not have reached a boiling point without the individual purpose and perseverance of Martin Luther King Jr. But long after his tragic assassination, other entrepreneurs, safekeepers, explorers, and advocates took up the expansion of civil rights to include women, the elderly, the disabled, the sick, and others. The history of great change efforts shows that participants bring great integrity, honesty, trust, and faith to bear on the status quo. Their work is not so much businesslike, but social-change-like. They use every driver available, including sophisticated, highly robust breakthrough networks. These tactics still exist today. They might be underappreciated in this moment of Type-A social entrepreneurship, but they are still effective in confronting new problems or in defending old breakthroughs. History also shows that change takes time and patience. Change begins with the belief that there is no such thing as an intractable problem today. Although there are quick breakthroughs from time to time, social change is anything but a wind sprint. This is why purpose and perseverance are so important to ultimate success. They must be inflamed, nurtured, and renewed at every turn. And they must be accepted as the bulwark of change. Click the cover image below to read and download the Winter 2010 digital issue of the Nonprofit Quarterly.